TO Social is the brand name under which you will encounter numerous niche events oriented to connect people in this city through a memorable experience. 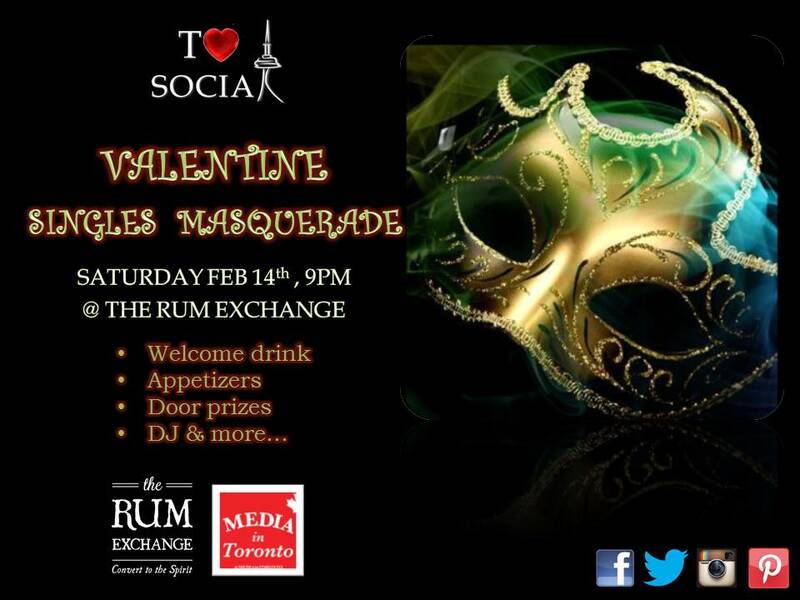 Our upcoming Singles Valentines Masquerade Party hosted at The Rum Exchange. Who says February 14 is just for the lovey–dovey duos? TO Social is putting a twist on Cupid’s classic day by throwing a Singles Valentine’s Day Masquerade Party. Our stylish event will take place on Feb 14, 9pm at our exclusive venue partner, The Rum Exchange located downtown in the financial district at 67 Richmond Street West (west of Bay Street). We will have light appetizers and focusing in a variety of sweet and delicious bite-size treats. And yes ladies and gentleman, eye candy for all! There will be plenty of opportunities to mix and mingle and get to know each other during the event. We will have simple and yet effective game to get you all to talk to each other. DJ DRAZ will be playing the music that we like to listen and dance. Cocktail attire and a mask if you feel comfortable, if not, just bring your sexiness! Early bird prices till February 11, ticket price $ 20 in advance, Regular $ 25, at the door $ 30, cash only.